Before the arrival of european settlers in 1500s, the land was the home to native Americans. The plantation was named for the ferry that crossed the Lynnhaven waterway in 1642. Close to this spot,Grace Sherwood faced Trial by Water and was found guilty of witchcraft in 1706. The widow will forever be known as the”Witch of Pungo”. After a short tour by curator and historian Belinda Nash, we began our vigil by establishing baseline EMF readings and photographing the entire site.The house seemed to welcome us, except for the ‘Best Parlor’. That one room seemed forbidding and much colder than any other part of the house. It was there I felt a icy finger trace the small of my back… During our EVP sessions, we recorded what sounded like the heart beat of the house that seemed to come from everywhere and no where at once. Amid a burst of video static, we captured the sound of a child giggling in the dining area. Through out the night there were unexplained loud crashes, whispers, humming and soft whistling. The team spotted the Phantom Cat that haunts the Ferry house on three separate occasions as it slipped silently up the staircase and out of sight. Spirit communication sessions produced some very good EVP evidence, ( see next page please) We asked the ghost “tell us your name”, and were quite plainly told “NO”. During the same session Doug asked if I had a battery. I didn’t, but Tony recorded the response,” JOHNNY GOT IT”. The most surprising evidence of spirit activity was caught quite by accident using a still camera. We routinely photograph all areas we investigate for later reference, and while photographing the Parent Room (Green Room), we noted something quite unusual. 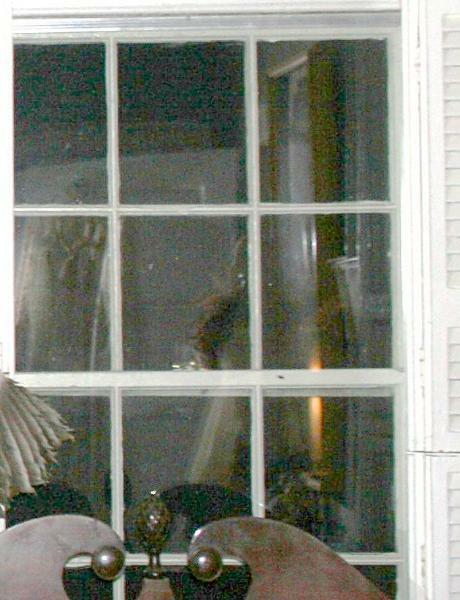 Standing somewhere between the camera and the window was an apparition of a young girl wearing a dark dress with simple white apron. Some see a small dog to her left. Because we documented the entire room, we were able to rule out the possibility of a mannequin or another dress being mistaken as the source. Careful review revealed none of the dresses displayed were similar to that worn by the apparition. 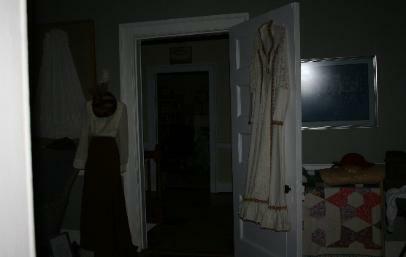 Port City Paranormal ® has investigated the Ferry House Plantation six times since our first vigil. 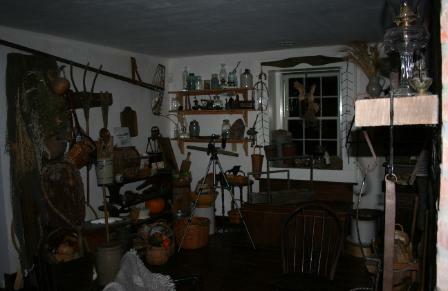 The plantation house is the source of our award winning EVP and photographic evidence. The house continues to amaze us with it’s many talkative spirits. Since 1696, this area was an important ferry landing. The first building on the grounds was a home built by Col. Anthony Walke. In 1735, also served as the first brick courthouse of Princess Anne County. The site has also been used as a post office, provost jail, tavern with boarding for weary travelers. The structure that stands on the property today was built by George McIntosh(1830). The river ferry delivered mail to the plantation house which was also the local post office. Two of the barred windows from the old Post office are still part of the house. Virginia Beach is also the home of the legendary Witch Of Pungo. 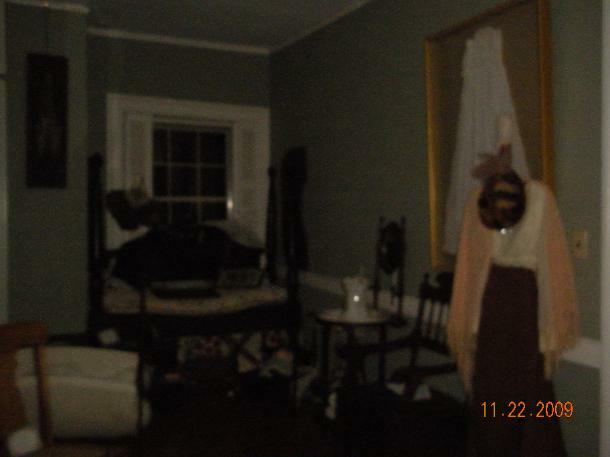 Please enjoy a sample of EVP we captured from our visits to the Ferry Plantation House in Haunted Virginia. 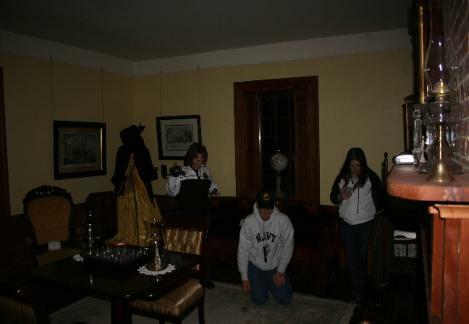 We began investigating the Ferry Plantation house in 2009 and performed our sixth investigation July 2013. Please see our other pages for more evidence and information on the Witch of Pungo, trial by water, Ferry Ghost Girl Photo.